Simple but elegant, this beautiful reception space offers a light and airy table and chair design, with a great pop in color with the floral arrangements. Having an array of short and high centerpieces allows for different dimensions to your space. The short or skinny centerpieces let guests be able to see across the table to other guests and an easier communication! Its fall which means these jade colors will be making a comeback, which does not make us upset at all! How gorgeous are these deep colors paired with the gold chargers? The floral arrangement set the mood and match the venue space perfectly with that warm romantic tone. The large skinny candles one the long tables allow for that same romantic flair, with guests being able to see across the table to their neighbor. Sometimes, less is more. This greenery garland and simple pillar candles create an airy and natural vibe. The tablescape is perfect for this farm table because it really showcases the gorgeous table itself. If you really look, you can see each place setting has a piece of greenery on their napkin which personalizes the space. It makes the space feel more welcoming and home-y! OOh LA LA! These varying heights of bright and fun centerpieces create such a fabulous atmosphere for this wedding. Having this kind of floral arrangements is perfect for a spotlight table, (hint hint) your head table! The lanterns and candle holders were perfect elements to add for dimension to the tablescape. We had so much fun playing with these colors to keep it fun yet romantic. 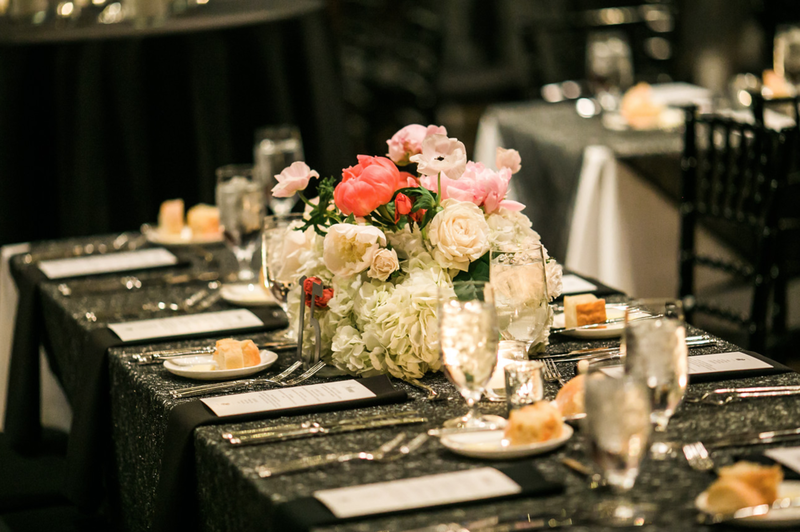 This dark and sparkly tablecloth paired with this light and airy centerpiece comes together for a beautiful combination. Mixing opposites together can cause a different, dramatic look for your wedding. Simple but antique varying vases allow for your table to have personality and character. We loved the simple flowers against the wood tables and chairs. They were differing heights and not one arrangement was the same, which made it classically gorgeous. The simple runner added a bit of color and elegance to the farm table.